Have you ever felt you just wanted to drop everything and walk away? Most of us probably have at some point in our lives and that is just what our protagonist in this month’s book does. 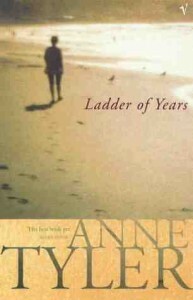 In Anne Tyler’s Ladder of Years, Delia, feeling expendable in life, leaves her husband, three children and comfortable home for an unknown destination. Tyler, one of America’s great contemporary writers, situates the novel in a conventional suburban home and humdrum lifestyle. Delia when young marries Sam the doctor who inherits her father’s practice and stays on in the family home to bring up her own children. A chance encounter with the dashing Adrian over the onions in the supermarket leads to a brief affair and more significantly acts as the catalyst for her to realise that she can act radically and do something to change her monotonous life. On a family holiday, dressed only in her swimming costume and husband’s beach robe she walks away. Indicative of her feelings of being unwanted is the fact that her family do not know what she was wearing the day she left or even the colour of her eyes! Most people felt that Tyler skilfully handled the potential implausibility of someone walking out of one life into another. In her new life, having sloughed off the obligations, emotional baggage and material belongings of her old self, Delia creates space to seek her real identity. Her sojourn away however ends with her in a new but more appreciative family as housekeeper and surrogate mother to a father and son. It is only when an invitation to her daughter’s wedding arrives that Delia returns to her original family, initially for a visit. After some quite funny episodes in the wedding that doesn’t happen, she realises that it was all a ‘time trip’. Aware that her children were soon to leave home, she had wanted to go back and start again, but do a better job this time. Tyler’s strength lies in her perception of detail and ability to identify key incidents, however apparently small. Most of us felt we could identify with some aspects of the novel though there was considerable difference of opinion about the central figure. Is Delia a wimp who needs to stand up for herself or is she a generous, caring woman who gives all to her family? Read the book for yourself and see what you think. We break now for the summer and will meet again on 15th September when we will discuss Margaret Atwood’s The Blind Assassin.